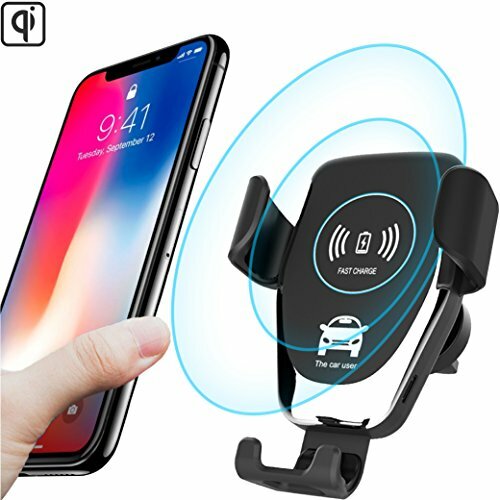 ✅【FAST Qi WIRELESS CAR CHARGER】Chargex wireless car charger is 1.5 times faster than cable and standard wireless chargers. Built-in large coils offer reliable 10W fast charging experience for compatible devices. Chargex wireless charger mount blends blends high-quality material, great look and intelligent chip all in one design, engineered to safely enhance your driving experience. ✅【SINGLE-HANDED OPERATION】Chargex can be mounted on almost any vehicles air vents and comes with an additional adhesive attachment for dashboard or any flat panel. The Gravity-Link design will automatically secure your phone in place and start charging immediately, minimizing the danger of using your phone while driving. Full 360-degree rotation for better viewing. ✅【2 IN 1 DESIGN】Chargex can be used as a wireless charger as well as a universal phone mount. You can navigate and charger your phone simultaneously while saving you battery on the road. ✅【COMPATIBILITY & CASE FRIENDLY】Chargex wireless charger works with all Qi-enabled devices: 10W fast wireless charging for Samsung Galaxy Note 8, S8, S8+, S7 Edge, S7 S6 Edge, S6. Standard charging for Apple iPhone X, iPhone 8, iPhone 8 Plus (without case), Nokia 9, Nexus 4/5, Lumia 920 and more. Fits most phone cases of 4-6 inches within 3mm thickness. ✅【HASSLE FREE WARRANTY】Chargex Quality Assurance- We promise a hassle free 90 days warranty for any issue. 100% risk-free purchase making it a good buy. Contact our helpful customer support for assistance.